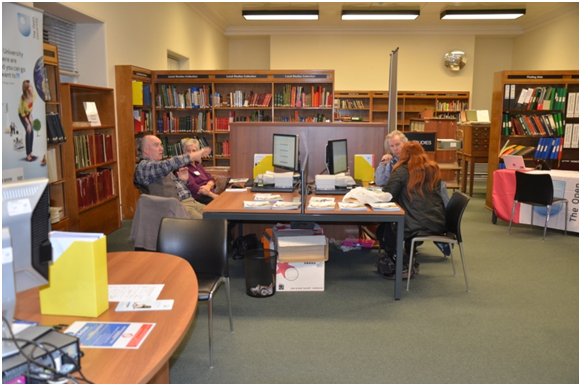 The staff at Brompton Library have been really busy – putting together Christmas reading lists for children and adults alike. We’ve been publishing a list every morning since Tuesday on the blog this week. When Detective Alex Cross gets a phone call on the night before Christmas, he knows he won’t be good news. Henry Fowler has kidnapped his ex-wife and his children. He is high, armed and dangerously unstable. Meanwhile, a major terrorist attack is unfolding. Will Alex save the day…? Set in Australia in the 1920s our heroine Phryne Fisher, wealth aristocrat and private detective, is invited to the Last Best Party of 1928. When three party guest go missing, Phyrne must follow the scavenger hunt clues to find them. Part of the Phryne Fisher series. A detective story without a detective. When Mrs Walker passes away in a frosty, Edinburgh flat, she leaves only an emerald dress, six orange pips and a Brazil nut engraved with the ten commandments. Meanwhile, Margaret finds herself back in Edinburgh on a whim and working for the Office for Lost People. Given the task of finding out who Mrs Walker was, the unusual collection of objects leads her into the past of Mrs Walker and ultimately into her own story. Nine of Simeon’s best Christmas tales set in Paris that see Inspector Maigret on cat and mouse chases all over the city, including following the trail of a mysterious intruder dressed in red and white. We see his paternal heart, as he is helped on many of the cases by some bright children. When Chief Inspector Gamache is sent to Three Pines to investigate the disappearance of a colleague’s friend, he discovers that the missing person is one of the most famous in the world. With no one he can trust, can he find a safe place for himself and his trusted colleagues? A chilling twist on the twelve days of Christmas when an obsessed stalker takes the object of his obsession hostage, he tries to win her over with a bizarre “gift” on each of the twelve days. Terrified that the final gift will be her death, Jessica has her own secret. Will it be enough to save her life? It’s the perfect time to come in from the cold, turn off the TV and curl up with a crime novel. Fractured family gatherings, suspicions and intrigue in remote country houses, Christmas provides the perfect backdrop to a case of murder. Here is a selection of some of the best in festive crime fiction. When heavy snow brings a train to a halt near a small village some of the passengers find shelter in a country house. The fire has been lit and the table laid but no one is home. As they unravel the secrets of the house, a murder strikes. A chilling Christmas classic. When multi-millionaire Simeon Lee unexpectedly invites his estranged family for Christmas, suspicions are raised. As Simeon plays with his guests’ emotions, the festive games turn deadly as he is found brutally murdered. Everyone has a motive but only one man can find out whodunit. An especially bloody Agatha Christie Christmas classic. Christmas Eve in a country house and the party is in full swing. As the clock strikes midnight the revellers find there’s more than just presents under the tree. Luckily one of the guests is amateur sleuth Mordecai Tremaine! Find out who killed Father Christmas in this long-forgotten classic first written in 1949. A collection of crime fiction from some of the best writers of the genre. A mixture of much-loved classics and more obscure tales, bringing together some of the finest crime fiction of the past. A cocktail of all the right ingredients to make the perfect country house murder-mystery. The Melbury family patriarch is found shot in the head by a guest dressed as Santa Klaus. His family all have a motive but not Santa Klaus, the only guest with many chances to pull the trigger! Get immersed in the action right beside Constable of Haulmshire as each character tells you their statement. A collection of crime stories set in Winter, often at Christmas. With mysterious tracks in the snow, some unpleasant carol singers and a very odd Santa Claus. A perfect collection of stories, each introduced by crime expert Martin Edwards. A collection of four of the best of P. D. James Christmas short stories, originally commissioned for magazines. Each of them tantalising puzzles to be solved, she keeps you guessing to the end with her atmospheric story telling. Set in December in 1930’s New York when prohibition is coming to an end. Can the rich and glamorous Nick and Nora Charles solve a murder case in between Martinis and fast-talking wise cracks? As the snow deepens around the village of Byford and its residents are settling down for Christmas, the vicar’s son-in-law is murdered. With a difficult personal relationship and a group of suspects all trying to sabotage the investigation, Jill McGowan pays homage to Agatha Christie in this classic with a rather uncosy twist. See you tomorrow for our final list! The staff at Brompton Library have been really busy – putting together Christmas reading lists for children and adults alike. We’ll be publishing each list every morning on the blog for the rest of this week. Today it’s Christmas reads for older children – a collection of classic tales and modern takes on Christmas themes for older children. An old-fashioned tale of a girl brought up with no mother and a strict father in a vast remote house. Unable to leave the house due to an unnamed illness, Charity knows little of the outside world, or even about her own family and has just her cat and a nurse to keep her company. She is haunted by a recurring dream about a secret corridor hidden in the house. When one day she finds the corridor, it leads her on a journey of discovery about her mysterious past. When a boy buys an advent calendar, he finds that each door of the calendar tells the story of a little girl who chased after a lamb and ended-up travelling back in time to Bethlehem at the time of Jesus’ birth. As he opens more doors he also finds out more about the man who made the calendar and Elizabeth Hansen a girl who disappeared many years earlier. Stories within stories in this magical Christmas mystery. Every year on Christmas Eve in the Tolkein house, a letter would arrive from Father Christmas. Tolkein wrote these for his children. The letters include stories and sketches and tales of an accident prone polar bear. Delightful for all ages. Christmas Eve and the bells of St Paul’s are ringing for the first time since the end of the war. Three boys make fun of the service until the hear the story of Christmas told by a fox and their innocence is restored. Written by Mary Poppins author L.P. Travers and recently reissued, The Fox at the Manger reminds us of the true meaning of Christmas. Born on Christmas day, Nikolas is given the nickname Christmas. When his woodcutter father is given the chance to work in the land of elves, Nikolas is left with his child-hating Aunt Carlotta but after a few months, he can stand it now more and leaves to find his father. The story of Father Christmas came to be, a magical and fun modern classic. Part of the Little House on the prairie series, its wintertime and the Ingalls family live among the wild animals. The story tells how they live together in harmony and sometimes in fear of danger. When Daisy and Hazel go to snowy Cambridge for the Christmas holidays Hazel is expecting dreamy spires and cosy fires. Two days before Christmas there is a terrible accident. Or was it an accident. Daisy and Hazel must do everything they can to solve the mystery before Christmas. Its midwinter’s Eve and Will can sense that something is not right. When he wakes up and finds himself in a snow-ravaged wintery land, he realises he must find six circles of light by twelfth night to stop the world being taken over by dark forces. William never thought he’s find a dinosaur at the north pole, but he does! The magical home of Santa Claus brought to life as you’ve never seen it before. When Paddington visits Santa’s grotto he causes quite a stir when he gets lost in a grand London department store, but will he get to meet Santa? A fun tale from our best loved bear. A tale on a farm, a fairy tale, Christmas in World War I and the Nativity story. Four beautifully illustrated tales from the children’s laureate. On Christmas Eve on holiday in Norway, Lotta wakes up to find herself in her Grandmother’s story. She has her own reindeer and calf to look after. When the reindeer goes missing, will Lotta find her before the calf dies? And can she ever go back to ordinary life? Louisa May Alcott’s classic tale of coming of age with the March sisters, as they prepare for Christmas without their father. Beautifully told with real and likeable characters. A very moving and timeless story. The staff at Brompton Library have been really busy – putting together Christmas reading lists for children and adults alike. We’ll be publishing each list every morning on the blog for the next four days. It’s the night before Christmas and everyone is ready – except Mr Wrong, oh and Mr Muddle and of course Little Miss Late, who only sent her letter to father Christmas that morning! Will he get it in time? Join the Mr Men and the Little Misses for some Christmas Eve fun. Join Ollie and Fred on Christmas Eve as they tell us everything they love about Christmas. Joyful and beautifully illustrated. When Father visits the Little Kingdom on Christmas Eve everything is going well – the elves have made the presents, the fairies have made the crackers and the pine elves have grown the Christmas trees. Uh oh! Wise old Elf gets stuck in a tree, Queen Thistle is wrapped up inside a Christmas present and King Thistle is trapped inside a Christmas cracker! Will they ever get out? A fun and Christmassy tale from the creators of Peppa Pig. It’s Christmas Eve and the little Tooth Fairy has been blown away! Not to worry. Who does she meet but Santa in his sleigh! A funny and magical fairy story told in a lovely rhyme with colourful and dynamic illustrations. A Christmas classic, illustrated version of Clement Moore’s poem about Christmas Eve. Nothing could be more festive. Get ready for Christmas with mummy and baby penguin as they bake cookies, decorate the tree, make Christmas lists and wrap presents. The true meaning of Christmas. Part of the popular series, this touchy feely book is perfect for baby’s first Christmas with bright colours and lots of textures from Santa’s boots to his fluffy white beard. The story of the Nativity in a bright and beautiful board book with great little details in the illustrations. A lovely retelling of the first Christmas. Join Duggee and his friends decorating the Christmas tree and giving out presents, but where is Enid the cat…? Join this family of mice as they get ready for Christmas, sitting by the fire, hanging decorations, making snowballs and playing in the snow. Celebrating the real magic of Christmas. With beautiful watery, wintery illustrations, this classic Charles Dickens tale is retold here bringing the story to life for younger children. A cautionary tale about being greedy, The Dinosaur Pooped Christmas is a less in being careful what you wish for… Not for the squeamish! Or how about learning a few words of Japanese, Greek or Italian to wow everyone over the turkey? We’ve got plenty of eBooks if that’s your thing! 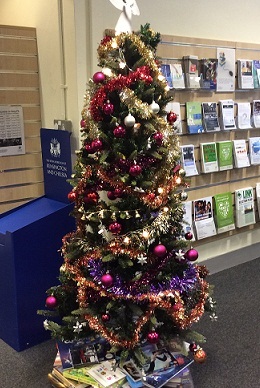 Christmas has arrived at Brompton Library! Brompton has now swung into full Christmas mode! We had our first Christmas craft session last Saturday and the youngsters decorated little card Christmas trees with glitter and all manner of sticky things. Their parents and carers were delighted! 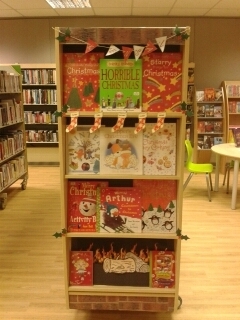 For the grown-ups we have our terribly tasteful Christmas tree complete with presents (library stock) underneath for the taking plus our hand-picked display of Christmassy books, CDs and films. Christmas music, books and more! For the rest of this month we have another Christmas craft session for children this Friday– please join us! 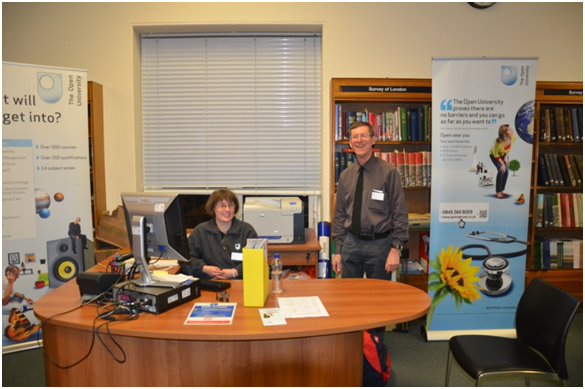 From Monday 15th December onwards the staff will be initiating the public who may be giving or receiving tablets and e-book readers into how to download our new, improved collection.